You probably know Warren Buffett’s excellent idea, now being pushed as the Buffet Rule tax plan by our current administration, to reinstate a more progressive income tax for ultrawealthy Americans. From 1936-1963 we had a top income tax rate of 80-90%, and a truly redistributive capitalist society. Deviant lobbies for the ultra-rich have dismantled this Depression-era wisdom since, and our society has paid the price of a growing rich-poor divide since 1972. If you haven’t read Buffett’s August NYT op-ed, Stop Coddling the Super-Rich, it’s worth five minutes. You may not know that Buffett gave us another great idea in July, when he made a humorous comment during an interview that we could penalize all sitting members of congress with ineligibility for reelection whenever the US deficit exceeds three percent of GDP. Buffett’s comment may have been in jest, but some see a serious idea at its core. Congress would never vote themselves such a penalty of course, but in the age of the internet, direct democracy could allow something like this to eventually happen, and it may just be the medicine the patient needs. An attorney, Jarrad Holst, pointed out that this deficit responsibility rule could eventually be enacted via a constitutional amendment, what we can call the Buffett Deficit Amendment, if a Convention for Proposing Amendments was called for by 2/3 of the states and if the amendment was then ratified by 3/4 of the states. If our state legislators in turn are elected largely by online campaigns, and their behaviors tracked online with respect to their campaign pledges, a world we can all work toward in coming years, we’d have the tools to get this done. After a majorly fiscally unsound term, we’d probably want to retire just a majority or supermajority (say, 1/2 to 2/3) of congresspersons in each party, randomly chosen, with the rest remaining, so that some institutional memory is preserved. The best number is a detail the game theorists and behavioral psychologists could debate. I’m also not sure if a 3% deficit is the right number to use, but it looks close, on first approximation. 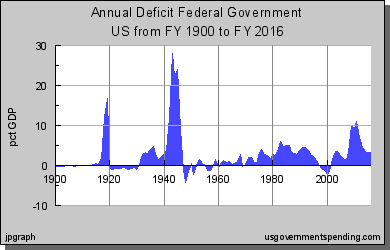 As you can see from the chart below, showing our federal deficit since 1900, in addition to our current congress we’d have fired two thirds of the congress of the late 1910’s, the WWII congress, Reagan’s congress, and Bush II’s congress. With this improvement to our constitution, the big spenders and false conservatives in each era would be exposed. While any congress could overspend any time they felt it necessary for the nation, they’d also face real consequences, the way the rest of us always do. They’d have skin in the game again. Political reform is all about realigning incentives. In order to work as beneficially as we are envisioning it might, this amendment would also require the coexistence of congressional term limits, that great impending reform (see TermLimits.org) that has made halting progress in some state legislatures, but remains blocked in our federal bodies for now. When we limit a congressperson’s term to twelve years, as in the most popular proposals, that aligns them less with special interests, their parties, and extending their own political careers, and more with their own best judgments. Along with campaign finance reform, and an accompanying set of limits on the amount of time one can spend as a lobbyist before or after a political career (8 years seems reasonable there, for a total of 20 years in politics at any level, which really should be enough for any aspiring do gooder or autocrat) more politicians can more easily choose to live the Founder’s ideal of the citizen politician. Twenty years of political service, preceded by academic training or work experience would allow a level of professionalism, but not so much that corruption and cronyism become dominant. Add in a big increase in the representativeness of our democracy in the legislature, via the addition of hundreds more short-term politicians in the House, a reform that Congress can do without any constitutional amendment, and we could even do something about our toxic lobbyist to politician ratio, which is greater than 700 to 1 now (see No Place for Amateurs, Dennis Johnson, 2001) at the Federal level. If we had the Buffett Deficit Amendment without these accompanying reforms, politicians might never be willing to run deficits, as they would have too much to lose by doing so. That might result in a government too fiscally hamstrung for its own good, as there are times when all of us need income beyond that which we can get via voluntary debt and credit (loans, bonds, etc.). But there also needs to be a cost to coercive borrowing of the state from the public and from the future, and a more rapid renewal of our political base seems to me a particularly simple and natural consequence. In particular, given the increasing frequency of deficits in recent years, and the increasing unaccountability of government, such an amendment seems to me like common sense. Why do we need to have such a severe consequence? Isn’t deficit spending sometimes good, as it can lead to surpluses later? Yes it is, but as Keynes argued, countercyclical spending is best done from money that has been previously saved for a rainy day. Deficit spending is spending of last resort, spending money that doesn’t exist. And without some break on it, irresponsible voters in once-wealthy nations may increasingly push their politicians into it, until the national debt cripples their future and their standing in the world. We’ve seen this recently in Greece, Spain, Italy, and we are now seeing it in the US. Amen, Mr. Anonymous. If you like this idea, please consider taking five minutes to create an account and vote for the Buffett Deficit Amendment at aGreater.US. This site is a promising early effort at using an online process to uncover and rank bipartisan bills, particularly those with a fiscally conservative, socially liberal focus. The site lists several other potential bipartisan bills, and unfortunately most of them aren’t yet well written or referenced, but they are doing their little part to help the 99% to bring an actionable bipartisan agenda to the 2012 election. I recommend reading the following bills and if you like them, giving them your vote as well. If you find any others there you like, let us know.